Time to enter my blue period. 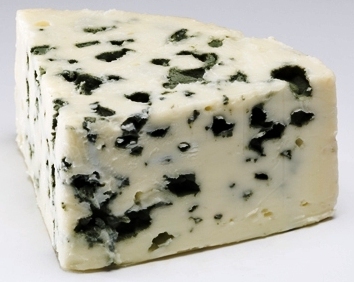 Roquefort is perhaps the “entry level” cheese for many of us. A non-controversial addition to cheese plates around the globe. I also find it’s one of the most abused cheeses, served far too cold to be enjoyed. This was, I think the first blue veined cheese I ever tried, and although not one of my favorites (that’s reserved for Stilton and Gorgonzola), there is always a hunk of it in my ridge. Traditionally, Roquefort is a sheep milk cheese, and in Euro fashion, apparently only those cheeses made in Roquefort Sul-Soulzon can called themselves”roquefort”. I bought my hunk from our loca French megastore and left it to sit for a while. For a cheapish over the counter cheese, the overall flavor sensation begins slightly mild, then a little sweet, then smoky, and fades to a salty finish. I’m told it’s one of the most ingredient intensive cheeses to make, with one kilo needed around 4.5 litres of milk to make. For such a common cheese it has a romantic backstory. It is said the cheese was discovered when a young lad, eating his lunch of bread and ewes’ milk cheese, saw a beautiful girl in the distance. Abandoning his meal in a nearby cave, he ran to meet her. When he returned a few months later, the mold had transformed his cheese into a chunk marbled with blue “veins”. I love blue cheeses…especially the ones you eat in Europe.